The Argentinian writer Jorge Luis Borges is a favorite of mathematics enthusiasts - many of his short stories and essays have overtly mathematical themes, and much of his writing plays with structure and paradox in a way that appeals to readers that have a mathematical bent (see this Wikipedia article on Borges and mathematics). 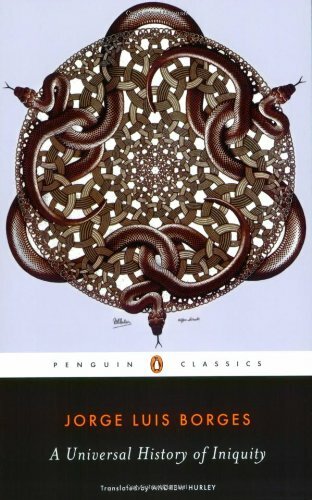 I just recently read his short-story collection, a Universal History of Iniquity, which does not have any direct mathematical overtones (that I can recall), but whose cover in the Penguin Classics edition plays homage to Borges' mathematical ways with one of M.C. Escher's limit engravings Snakes. In keeping with the mathematical theme, a new cover for the same book features the origami tessellations of Eric Gjerde (see his post about the cover here). The tessellation is Gjerde's water-bomb tessellation, and is one of the more easily folded models from his book. See this video on Happy Folding for a demo of how to make the water-bomb tessellation - it is fun to fold, and can be playfully integrated into other origami projects... for example, Beth Johnson has turned it into a sheep.